TORONTO, March 26, 2019 /CNW/ - Today, Sun Life Financial Inc. ("Sun Life") (TSX: SLF) (NYSE: SLF) released its 2018 Sustainability Report and its 2018 Public Accountability Statement. Sustainability is a matter of global significance and Sun Life is dedicated to supporting international efforts in the area – through its own programs and practices and by working collectively with governments, businesses and community groups to advance sustainable development solutions. "Sustainability is central to our overall business success and strategy," said Melissa Kennedy, Executive Vice-President, Chief Legal Officer & Public Affairs and executive sponsor of sustainability. "We believe this focus is a key differentiator for Sun Life as we strive to be one of the best insurance and asset management companies in the world." The 2018 Sustainability Report highlights achievements in Sun Life's key sustainability areas of focus and reaffirms its commitment to help tackle social and environmental challenges, from climate change to rising diabetes rates. Sustainable Investing – Invested almost $2B in 2018 to develop resilient, safe and sustainable infrastructure in cities and communities, bringing Sun Life's sustainable infrastructure investments portfolio to almost $15B. Corporate Governance – Signed the Catalyst Accord 2022, which aims to increase the average percentage of women on boards and women in executive positions in corporate Canada to 30% or greater by 2022. Sun Life is currently exceeding this target with women comprising 33% of its Board of Directors. Digital Innovation – Teamed up with Lazada, the leading online shopping and selling platform in Southeast Asia, to make it easier for Filipinos to obtain insurance online, giving them access to affordable protection products from Sun Life. "At Sun Life, we invest for the future – for our Clients, employees, shareholders and communities," said Dean Connor, President & Chief Executive Officer, Sun Life Financial. "We are focused on creating a diverse and inclusive culture – one that unleashes creativity, fosters innovation, builds the best teams and drives value. Our relentless focus on Clients is fueled by, and depends on, an organization that is competitive, forward thinking and sustainable for the long term." 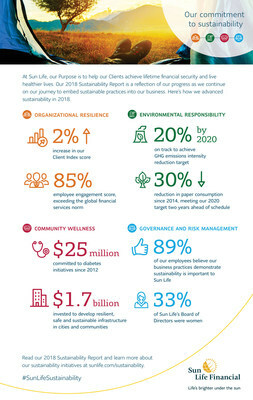 For more information on the sustainability initiatives undertaken in 2018, visit www.sunlife.com and read Sun Life's 2018 Sustainability Report and 2018 Public Accountability Statement.